This baguette has many inspirations: the long cold autolyse from Anis, long cold bulkrise from Gosselin, SD instead of instant yeast from David's San Joaqin SD... With 12 hr autolyse, 24 hr cold rise, the process last at least 40 hours from start to finish, however, very little time is spent on real work, most of the time, I just have to wait and let time do its magic. "Little hands-on work" does NOT equal to "easy to make", in fact, with the extra long process, there could be a lot of variations on how much to S&F, when to start and stop fermentation, etc, not to mention shaping and scoring continue to be a challenge at 75%+ hydration. With plenty of tweeking and adjusting, tthe end result is DELICIOUS: thin and crackling crust dark from all the caramalized sugar, airy and moist crumb, sweet and layered flavor - in the past 2 months, this is our weekend dinner of choice. I have made it at least once a week, sometimes twice a week. 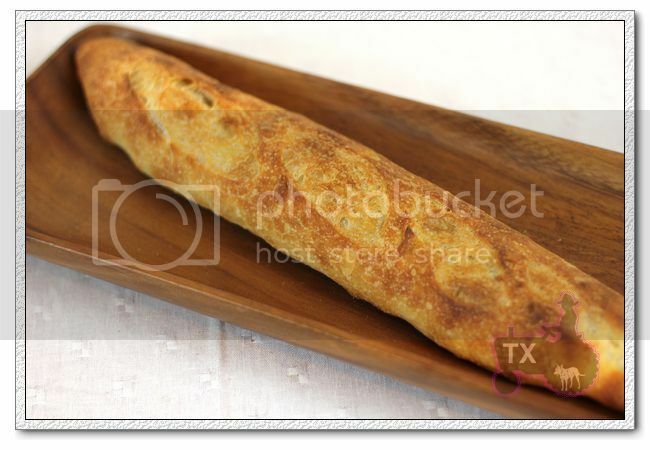 Right now, this is my favorite bagette to eat - and to make. 2. add starter and salt to the dough, use hand to mix until roughly evenly distributed. Note that the 100% starter here has two purpose: it's levaining power to raise the bread, AND it's extra water acts as the "2nd hydration" step in the original Anis formula. To make it even better, the consistency of the starter is much closer to the dough than pure water, so it's easier to mix. 4. 24 hours later, take out dough, if it has not doubled or nearly doubled, give it more time to rise at room temp. I usually have to give it about 1 to 2 hours, depending on temperature, which means the dough can probably be stored in the fridge for even longer than 24 hours.Do make sure it has a sufficient bulk rise, so the dough is strong enough; but don't let it go too long, the dough will be so bubbly that the shaping would be difficult - this is where you need to experiment with timing a lot. 5. divide and rest for 40min. There is a lot of room here in term of how to arrange the bulk rise timing - more time before fridge, less during/after; OR more in the fridge; OR now that it's cooler at night, put the dough outside instead and skip fridge all together... The goal is to give the dough a long sufficient bulk rise, regardless how it's done. The key for me is to learn how the dough "feels" and "looks" when it's properly fermentated, so I know I've gotten to the finish line, using whatever fermentation schedule. Before I thought the most difficult part of making baguettes is the shaping, now I thihk it's in managing fermentation - even though I am really not doing anything in that step. Since we love to eat it, I will conitnue to make this bread a lot, hopefully I will get better with scoring this wet dough! Right now, I am not even trying to get ears, just aim to have the cuts expand properly in the bake. Sending this bread to Wild Yeast's YeastSpotting event. Another great demonstration of how successful you can be fitting bread baking into a busy schedule. Your SJ SD is a big inspiration for this bread, thank you so much! Wow, no wonder its your favorite loaf. It's internal structure is remarkable! I bet some bakeries would love that recipe. Most bakeries probably would think the long schedule is not worth it, good thing we can make these at home! I find your summary of work time and elapsed time very useful. Thanks. I am glad you find it helpful, it meant as a rough guideline, most probably will need to adjust more or less. 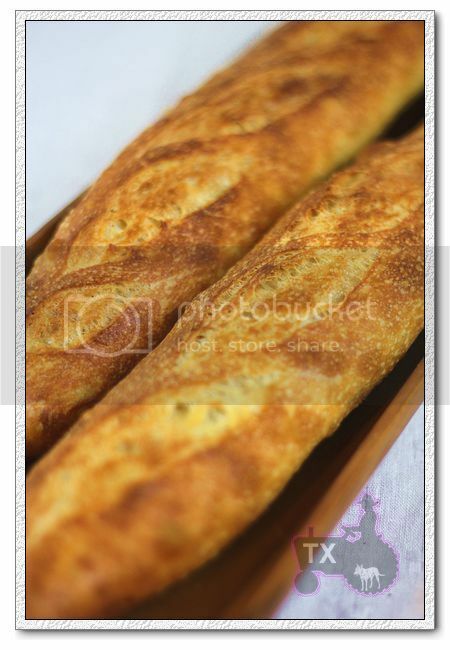 very nice writeup on your lovely baguettes, thank you for sharing! THank you for being so encouraging! Wow... that crumb is amazing! Would you mind if I post this on the front page for a bit? Wow, those are very awesome. Amazingly awesome. I think mastering fermentation is the most crucial aspect for all breads. I'm still at the lower end of that learning curve - but you, txfarmer, have mastered it. THank you for the kind words, but I am far from "mastering" it, just experimenting and trying out ideas, that's the fun of it right? Natural levain and cold fermented all that time...plus the small matter of 75% hydration. never mind about S&F but what is Bulk rise? Fermentation: (1) the process by which yeast metabolizes sugars to produce carbon dioxide and alcohol (2) (aka bulk fermentation, first fermentation) the period of time the dough rests after mixing and before dividing/shaping. I'll be trying this one soon. Thanks for sharing. I will definitely keep you posted when I try it. Great job, Txfarmer, as usual! For me, this recipe gives 4 baguettes, each has about 220g of dough. It's tight on my 16x16 baking stone. I might have to half the recipe to suit my small oven.... I will be home for a wekk in October, and if I have a chance, I'll make them in my regular oven. That's the most open crumb that I can imagine. Awesome. I'm attempting to follow your instructions at the moment. You say to let the initial mixture of refrigerated flour/water mixed with 150g starter and 10g salt rise for ~ 3 hours until it grows about 1/3 in size, while doing a stretch and fold every half hour. My problem is that the way I do a stretch and fold it degasses the dough and it essentially returns to its initial bulk. In other words, if I keep doint s&f every 1/2 hour I don't think the dough will ever get much larger than it started because I keep degassing it. Can you help me? S&F is not degassing the dough. For me, I simple oil my hands, take out the dough, gently stretch it with my right hand, fold back (seam under), repeat with left side, put back to the container smooth side up. The whole process takes <1 min, consists of 4 movements exactly (right hand out, right hand in, left hand out, left hand in), the dough never touches the table (so there would not be sticking), just my well oiled hands. That's just my way of doing S&F, there are other ways that's equally effective, but however you do it, be gentle, do NOT punch down, you should be able to preserve most of the gas. Thanks. I'm at that point in the recipe now and I see that the next time that I do this I will pay more attention to getting the dough into an oiled container to begin with and oiling my hands to manipulate the dough. That worked really well. I have the dough currently fermenting in a 75 degree environment. I look forward to baking these tomorrow and seeing if my crumb comes anywhere near that amazing crumb that you have produced. Thanks again for the initial posting and the help along the way. First try - pretty good! It jsut gets better and better. I was more comfortable having done the process once and noted things to improve in my implementation of the techniques in my kitchen. I have a 15 x 20 stone specifically to bake large baguettes so I upped the recipe a tad and did 2 500g baguettes. while not as totally amazing crumb as yours, they're on their way. I can't thank you enough for this formula. The dough feels tremendous at the end of the bulk ferment, pliable but full of life. I've often done long fermentations and gotten into proteolytic situations where the dough has lost it's body and become morbidly flaccid. There is none of this here. There are many differences between this formula and how I've been treating my dough. I dont know which technique changes are more meanful than others but I intend to keep experimenting. Off hand, your initial remonstrance to be more gentle in my stretch and fold was tremendously helpful. Your post division, preshape rest of 40 minutes instead of my usual 15 was interesting, baking baguettes at 460 instead of 550 is quite different than my previous efforts. Then, of course, there are the two long ferments. There's no denying results and these results are fabulous. I'm just wondering which technique changes are the most effective. It's great fun. I love baking so much, especially with just flour, water, and salt baguettes, batards, etc. where the only differences are the techniques of manipulating the processes with he same ingredients. So, thanks again. Somehow there seems something incongruous about calling an open crumb, bougouise baguette a Texas Farmer inspiration, so I'm working on what to call it as I work with it. I am so glad that it's working out for you! Look at those holes! I think the gentler handling made the biggest difference. Let time and wild yeast do the work, and we just stand back and not be in the way. Since baguettes need to be stretched out, it would get more "man-handled" during shaping more than most of other breads, hence the longer bench rest. This way the dough is sufficiently relaxed so it would take less "handling" to stretch them out. I think "minimal" handling to accomplish what needs to be done is the key for an open crumb. At some point in my journey I got the idea that baguettes needed really high heat for rising and crust. 550F and the top shelf and plenty of preheating. This has certainly put the lie to that! I was so pleased with these being nearly 20 inches long but still not burnt on the ends closest to the sides of the stone. That may be a combination of a lower baking temperature as well as slightly oversized parchment paper that shielded the ends from blackening. Yes, I agree that the gentler handling is probably important. When I divide them I also do a little bagetty preshape to minimize handling in the shaping phase. This time I proofed for an hour since the first batch blew out its seams a bit after 40 minutes. They do get manhandled pretty savagely to get beguettized but seem to bound back admirably. It's amazing how well some people can manage dough on the bench. Practice, practice, practic. The dough is still cold enough for me that I can get pretty good slashes for ears. Again, this is such a thrill for me to be able to do really long fermentations without turning the dough into a proteolytic puddle. I've never been a fan of overnight fermentations in the loaf shape, it's never worked for me, so this is great to do the shaping after the long fermentation. This morning it was lox and cream cheese and baguettes. Delicious! I'm interested as to how these techniques will transfer over to a petite batard shape. If I get anything interesting I'll post it. I wonder how the whold deal would work running through the KA rather than by hand. I wanted to ditch the KA awhile back altogether "by hand only" but I didn't and I've been using it more lately. Doing some cakes and pastry as well as my usual bread obcessions. Your technique has been a great hit and help with me. I intend to keep expanding and exploring. 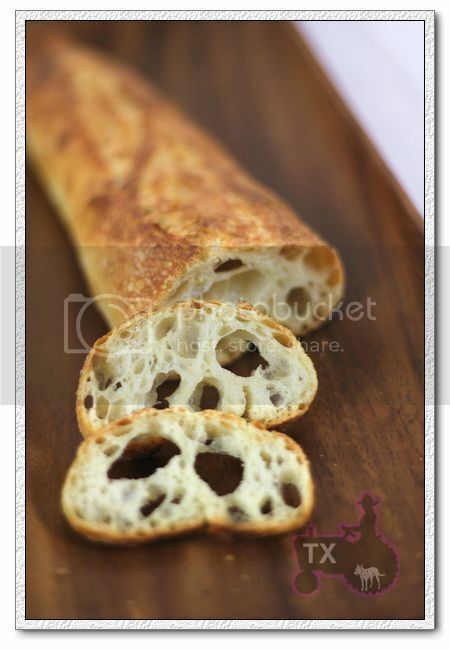 The keywords for this baguette are: wet dough, min. handling with enough S&F, and long fermentation. I think these can be applied successfully to any dough, not just baguette. I made the basic country loaf from the new Tartine Bread Book this weekend, 77% hydration, no kneading, the S&F procedure is very similar to this, and I retarded the dough after shaping (which I often do with success) - great results. Since boule and batard shapes are easier than baguettes, it's easier to keep those bubbles inside. I will post a blog post about it later, but the crumb is amazingly open and moist. Bâtards turned onto parchment paper. That's a piece of poster board for my 20" peel. They looked pretty good. I would have liked more vertical lift. I think it's a pretty loaf of bread. Still with a wonderfully open crumb. I'm thinking I might try bumping the hydration down to 73% from 75% to try for a bit more vertical spring... I don't know what that will do to the crumb though. For all this fermenting, I still am looking for more flavour. That's why I substituted the whole wheat in for part of the white flour. It did make the dough a bit sticker and slacker as well as adding some whole wheat flavour. I think I'll try about 10% rye as well. I can't thank you enough for this recipe. I hope you enjoy the report. I wanted you to know that your inspiration lives on in my kitchen. With the ww flour, I would bump UP the hydration since ww tend to absorb more water. As far as height, maybe you can do an extra S&F or two? Another idea is to shape into a boule and bake it in a dutch oven type of container to keep the shape better. Or maybe keep the temp very high for the first 5 min to encourage a speedier oven spring. Regardless, this is already a first-rated loaf! I've been following your progress with this recipe, and wow, you are doing a great job! Tomorrow will be my first attempt, I am a little "out of practice", haven't made a baguette in many months, but - it's exciting to try this method by our very own Txfarmer! Fingers Crossed. No scale! That's a touch bridge to cross! Good luck. Txfarmer, thank you thank you thank you! anyway, worked great - I hope I can get some nice photos out of it, don't have much time to work on them today, but hopefully later in the week I'll do so and post here. By far, the best batch of baguettes I've ever made, I know it will get better the more I play with it, shaping is tricky, but doable. Good for you! I'm completely enthralled with this formula - I'm doing it over and over with different flour combinations. I love the big holes. Ain't baking' great?!? Sally, congrats! I am so glad it worked out for you! Even without precise measurement. Paul, I am so happy to see that you are liking this formula so much and keep tweaking it. I have made variations of it myself, all with great results. I will collect the pictures and do a combo post later. I have tried making sourdough based baguettes in the past, but they usually turned out with less light crumb and less holey compared to yeast based ones, so I definitely want to try your method next time. Thank you for sharing. 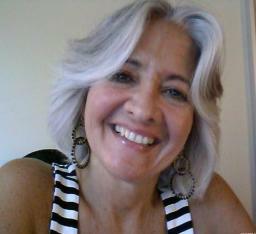 Your posts are always inspiring and enlightening. Can I ask you something? Can you elaborate the explanation on your method of S & F for me please? The whole process takes <1 min, consists of 4 movements exactly (right hand out, right hand in, left hand out, left hand in), the dough never touches the table (so there would not be sticking), just my well oiled hands. I understand other S & F methoeds would be as effective as yours (I usually S & F in a bowl or letter-folds on worktop), as you mentioned, but I'd like to try your method, too. Jjust 4 movements. Once. When I say <1min, it's actually just seconds. All I am doing is gently stretch the dough out to either side and fold it back. with 500g of flour, the dough is small enough for me to do it in my oiled hand. It's really not complicated, don't overthink. After such a long autolyse, and some mixing in the beginning, it would already have some strength at the very first S&F. Try it and you will see. How do you do your "steam bake". I am new to this and have only done the no knead method. Your recipe sounds like something I could do (physically). But have never done steam bake. Can't wait to try. • The Cast Iron Pan Method: Under the stone, even on the bottom of the oven, if you like, place a cast iron pan and let it heat up along with the stone. Not one you like to use day-to-day, because this process will rip the seasoning right off. Just before you put the bread in the oven, boil some water. Get a towel and, after you open the oven door, cover the glass of the oven door with the towel. This will prevent water droplets from hitting the hot glass and shattering it (ask me how I know.) You may also want to shield the front of the pan with aluminum foil so that droplets don't jump out of the pan onto the glass and crack it (again, ask me how I know). Load the bread and dump one cup of boiling water in the pan. WEAR MITTS WHEN YOU DO THIS. Close the oven door, and let it bake. 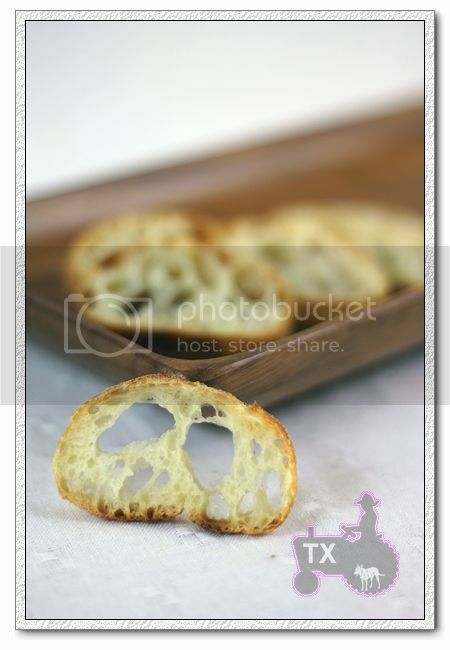 About halfway through the bake, remove the pan so that the bread can finish in a dry oven. • Covered Cooker Method: In this method, do not use a baking stone. Instead, place a cast-iron Dutch oven (enameled and non-enameled both work fine) or a clay cloche (Sassafras makes a good one - you can find them at Amazon or King Arthur Flour for about $50) in the oven and let it heat up for 45 minutes. Pull out the oven rack, take off the lid, plop your bread into the bottom, score it quickly and replace the top and the rack. 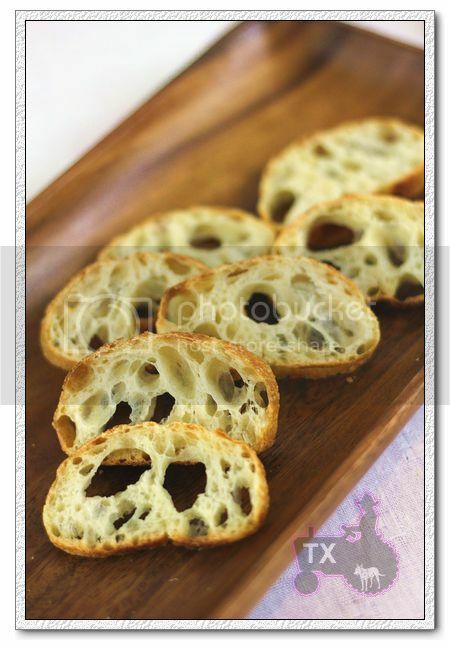 About 15 to 20 minutes before the bake is done, remove the top so that the bread can finish in a dry oven. The covered cooker captures the steam given off by the dough, and so mimics a wood-fired brick oven. Unfortunately, this method only works for round loaves (though Sassafras also makes a 14 1/2 x 5 1/8 inch clay cooker which works for batards). TxFarmer, Let me add my praise to your skills, as well. Your mastery of bread making is absolutely awesome. Thank you for sharing. How to do the starter? I'm very new to bread making and would love to make this bread. What do you mean by 100% hydration starter: 150g? It's me again... I've never started a sour dough starter before and after reading some of the comments on starting a sourdough... got even more confused ! For any new comer, I would highly recommend to go to the "Handbook" and "Lessons" section of this website, it would save you a lot of time and headache. Sourdough Cronut - Hey hey hey, remember me? Traditional Sourdough Pandoro - Merry X'mas!